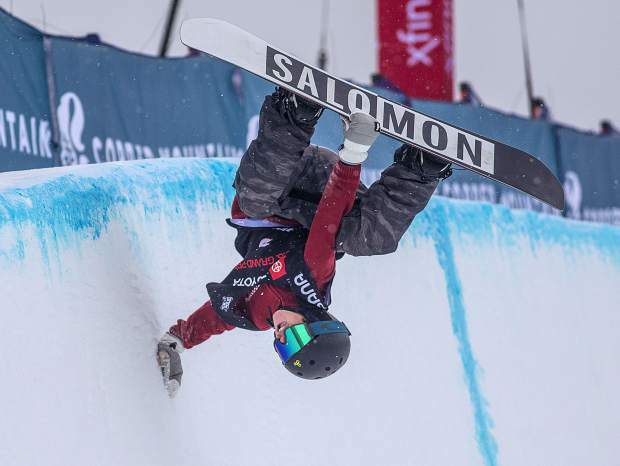 Jack Coyne performs a handplant in the halfpipe at the Toyota U.S. Grand Prix qualifiers on Thursday, Dec. 6, at Copper Mountain Resort. Coyne, 16, fell in both of his runs, but enjoyed his time in his first-ever World Cup event with tricks like this one. It’s a rite of passage 16-year-old Jack Coyne of Edwards endured with a smile on Thursday at the Toyota U.S. Grand Prix competition and FIS World Cup. It was Coyne’s first-ever Grand Prix appearance, and he dressed for the occasion, wearing a thrift-store Christmas sweater. Pates — who qualified for Saturday’s snowboarding final round, scheduled for an 11 a.m. start — said he has seen some of his teammates on the U.S. halfpipe snowboarding team learning new tricks in recent months. Wachendorfer’s season was abbreviated last year when he fractured a couple of bones in his arm during the Dew Tour halfpipe contest. Wachendorfer landed a couple of solid runs, but was bumped into sixth in his heat, where the top five qualified into Saturday’s finals. You can watch Pates and the nine other men’s snowboard finalists on NBCSports.com starting at 11 a.m. on Saturday.